Not that campaign and advocacy successes are rare but they are a bit like buses, nothing happens and then you get three at once! So it’s a good time to share those and pause momentarily to enjoy those before moving on to the next phase; there is always a next phase! Although it didn’t make it onto the public agenda, the 2010 election marks a significant historical point on overseas development aid. All three main political parties made manifesto commitments to not just achieve the 0.7% of gross national income to overseas aid, but also to bring in legislation to ensure that this is legally required rather than a whim of a government. The fight against corruption took a giant leap forward as the Bribery Bill was passed in the last gasps of Parliament. Whilst on climate change the UK government made an important bridge-building announcement in an attempt to move the process on. 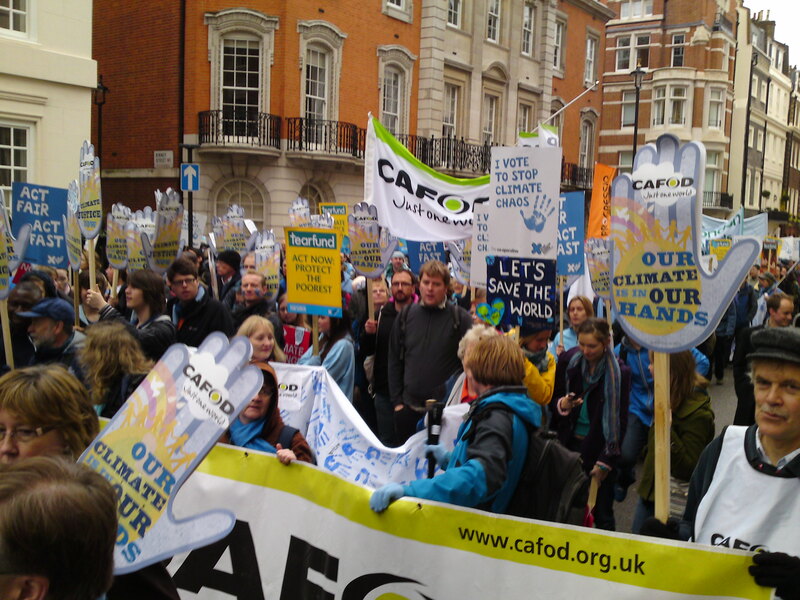 Without getting bogged down in the attribution debate, we can be sure that CAFOD played a very important and significant part whilst recognising ourselves within wider group of agencies. Bribery by multinational companies is prevalent in many developing countries: the World Bank conservatively estimates that $1 trillion in bribes is paid each year. Our work on extractives has highlighted the problems of corruption and the Bribery Act will make it easier to prosecute UK companies for bribing foreign government officials in order to win business. Such corruption undermines transparency and effective governance; it discourages foreign investment, wastes public money and poses a risk to the delivery of essential services. The Bribery Bill becoming an Act occurred during ‘wash-up’, the horse-trading between parties after the election has been called which decides which Bills will be passed. This last gasp stage involved much work including asking Andrew Mitchell (Shadow DFID) to talk to his neighbour in the parliamentary offices, Jonathan Djanogly (Shadow Solicitor General) who was leading on it for the Conservatives, on the importance of this Bill for development and so not to water the bill down. This had all been preceded by coalition work on countless meetings with government and shadow ministers, MPs, obtaining pro-bono legal advice on the legislation and converting these to submissions, whilst using the media at key times and keeping campaigners up to date. 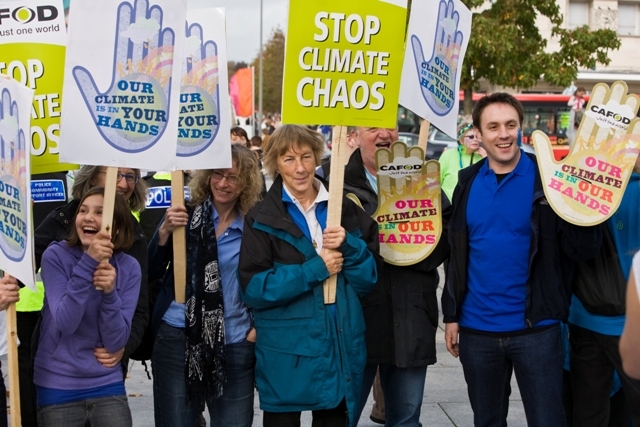 After the disappointment of climate change talks in Copenhagen, the recent announcement by the UK government to push for a second commitment period to the Kyoto Protocol was significant. The close links with developing country delegations had informed our position that in order for trust to be built between the Annex 1 countries (those who caused it) and the rest commitment to a second Kyoto period was critical. It was also a matter of justice that those who caused it took responsibility. Along with Christian Aid and Friends of the Earth we maintained a strong line on this before, during and after the UNFCCC meeting in Copenhagen. General public pressure on the government was strong through campaign actions and from The Wave demonstration. Specific campaign actions were undertaken in Copenhagen on saving Kyoto and strong quotes in high profile media articles added to this. Direct lobbying work was undertaken with Ed Miliband, Gordon Browns special advisers and EU delegations. In the difficult time post-Copenhagen when next steps were not clear, we maintained the public pressure through campaigns and presented good concrete recommendations to the government on aspects of the EU strategy that could be changed to move international negotiations forward, with particular emphasis on the need to change the position on Kyoto. Congratulations to all campaigners, you’ve acted and you have won some great successes! Sadly the battle is not over but together we continue to move forward for justice. This entry was posted in Campaigning, Volunteering and tagged advocacy, aid, aid work, CAFOD, CAFOD PLYMOUTH, Campaign, News, Plymouth, Successes by CAFOD Plymouth. Bookmark the permalink.